Financial support from the Swedish Competition Authority is gratefully acknowledged. We are also grateful to IMS Sweden and Tillväxtanalys for supplying the data used in this paper. The authors declare that the founding source had no role in the development of the article. The authors declare that they do not have any conflicts of interest that are relevant to the content of the article. The indicator variable DPS2009 is based on the last of the three criteria for the price cap to become effective (see “The reform” section), so that the indicator takes the value 1 six months after patent expiration for the period after July 2009. As a sensitivity analysis, we have also performed estimations with two alternative variables, Generics4_2009 and DPS2009_Binding. Generics4_2009, is based on the second criteria of the price cap and takes the value 1 from July 2009 if there have been positive generic sales for at least 4 months. DPS2009_Binding takes the value 1 if the brand-name drug actually lowered its price in the summer of 2009 and 6 months had passed since patent expiration. DPS2009_Binding is thus intended to indicate if the price cap were binding. Note that both Generics4_2009 and DPS2009_Binding are potentially endogenous; the first since generic entry and exit depends on prices and the second since the price cap can only be binding if the second criteria is fulfilled, if generics are sold at below 30 % of the patent price, and if the brand-name drug had not already reduced its price with more than 65 %. For the model where MD sales and the vector of potentially endogenous variables, W, are excluded, key results are reported in Table 4. To facilitate comparisons, corresponding results from estimates with DPS2009 are also presented in the table. As can be seen, the estimated total reform effect remains nearly unchanged under the alternative specifications. This is true also for models with MD sales and/or W included. Similarly, individual estimates are not very sensitive to choice between DPS2009 and Generics4_2009. However, the estimates for DPS2009_Binding are significantly different from the other two. Using this variable also reduced the estimates of Oct2009 with nearly one standard error. Yet the estimated total reform effect remains relatively unaffected, since this variable only take the value 1 for about 25 % of the observations after July 2009, while the corresponding figures for DPS2009 and Generics4_2009 are 95–96 %. Almarsdottir, A. B., Morgall, J. M., & Grimsson, A. (2000). 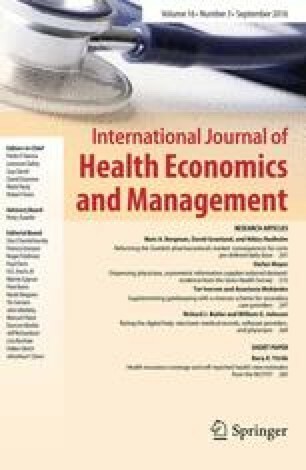 Cost containment of pharmaceutical use in Iceland: The impact of liberalization and user charges. Journal of Health Services Research & Policy,. doi: 10.1177/135581960000500209. Ministry of Health and Social Affairs. (2009a). Regeringens proposition 2008/09:145, Omreglering av apoteksmarknaden [The government’s bill 2008/09:145, reregulation of the pharmacy market (in Swedish). http://www.regeringen.se. Ministry of Health and Social Affairs (2009b). Lag (2009:373) om ändring i lagen (2002:160) om läkemedelsförmåner m.m. [Law (2009:373) about change in law (2002:160) regarding the pharmaceutical benefit scheme etc.] (in Swedish). http://www.riksdagen.se.